Card: King of Summer – from the Fairy Tarot Cards by Doreen Virtue and Radleigh Valentine. Message from the Faeries: Last week we showed you an example of the Divine Feminine. This week we are presenting you with an example of the Divine Masculine. This Faerie King is a fine example of the kind and nurturing man who is able to express his emotions in a clear and gentle way. He knows how to give and receive love. He knows how to be in a healthy relationship and knows how to bring out all the best qualities in his partner. We encourage you to try and see yourself in the qualities of this male. It’s okay to explore your male aspect. Have you ever encountered a man like this? We promise they exist! In fact they exist in all the men in your life. However, if someone is in alignment, you will recognize these qualities in them. How can you help foster relationships that allow the Divine Male to present itself? How can you foster those aspects to show express themselves through you? 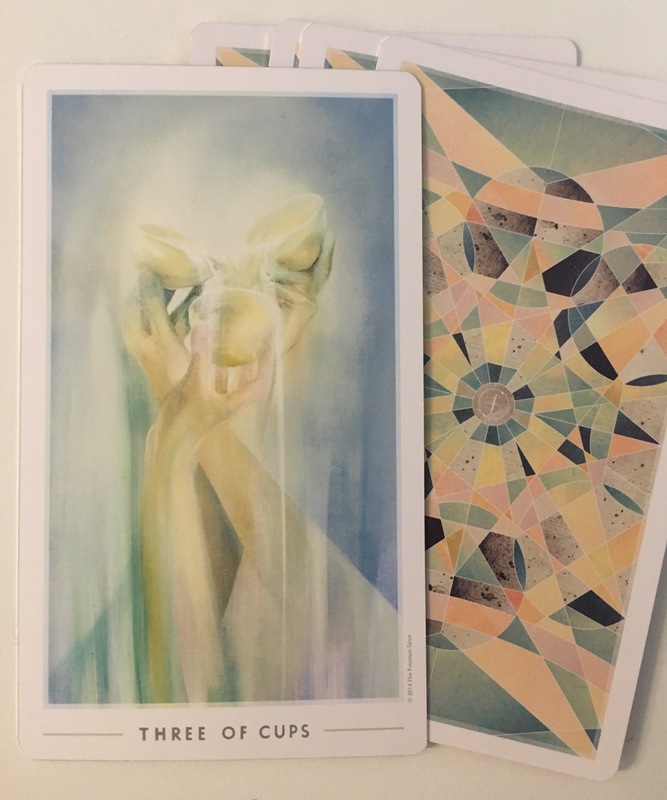 Card: Three of Cups – from The Fountain Tarot by Jonathan Saiz. Message from the Faeries: Now that, for some of you, the fall season has begun, it is time to relax a little and reflect on all of your accomplishments. Be thankful and grateful for all that you have achieved in your life until this moment. Think about how got to where you are today. All that you have and all that you know – did you get to this moment all on your own? No, you didn’t. You had a lot of help along the way. This week is the perfect time to remember everyone that’s helped you on your life’s journey. It is a could practice to honour and respect them. Show gratitude and appreciation for all of your friends and family, and even the strangers who were there for you when you were in a tough spot. One way to honour them is to tell them how much they mean to you – call them up, send them a message or buy them a little gift. Another way to honour this love of family and friendship is to return the kindness – to them or to a stranger. This is the time to be generous: with words, actions and deeds. There are so many people in the world right now that could really use a helping hand right now – give whatever you can. Autumn is a time of abundance and wealth, and most importantly: sharing. Let the energies of love and charity flow at this time. We also want to remind you that the Three of Cups is your own personal trifecta: body mind, and spirit. Are these three things in balance and harmony right now? This would be a good week to start working towards bringing the three together so that you are well balanced going into the winter season. 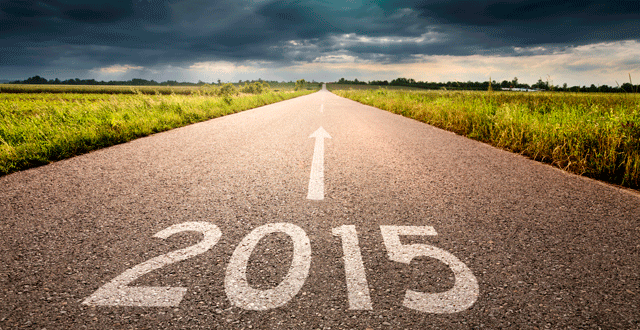 What does this exciting New Year have in store for us? One of my passions in life is doing tarot readings for people. I absolutely love it, and I hope to be doing lots of readings for people this year. I love to be a channel for The Faeries and The Angels, in assisting people with their loving guidance. If you would like me to do a reading for you, to see what 2015 has in store, you can purchase a reading here at my Etsy shop. Until the end of January, all of my readings are 50% off, which is a really great deal. That includes my 12 Month Tarot Readings, where I am guided to select 12 cards for each month and do a reading for each card. If you feel like you can’t afford a reading, don’t let that be a barrier as I am also open to doing trades. You can leave a message or email me at faeriemessenger@gmail.com to make an arrangement. This life. This life is such an incredible journey. How blessed am I to be here right now? I am so full of gratitude right now for my life. Just for simple being alive and for all of my life experiences. I find myself feeling more gratitude then ever these days. Even though lately I’ve been have been going through a very rough patch with my job, I am still grateful that I have a job that allows me to take time off when needed, and has great benefits. One of the things that I am most grateful for these days is that I feel I am becoming more and more honest with myself. It never occurred to me that I was dishonest person, until the last couple of years where I have had to really face that fact that I had created situations in my life that were incredibly unhealthy. I was lying to myself before. I used to blame everything on everyone else. I wasn’t able to see that I helped create these relationships and situations. I would play the victim. It’s still an ongoing process, but I can say that it’s been quite the journey that will never end. The thing I am learning about being honest with myself is that it’s like an onion. Once you shed one layer of lies, there is another one right underneath. It brings new meaning to the expression: You can never be too honest. It’s quite humbling to realize that I have a long journey ahead of me. Perhaps this sounds daunting, but it really isn’t. This is quite simply life. I am always taking new roads on this journey, and I will forever be learning about myself. It’s my favourite pursuit! I don’t mean this in an egotistical way, but I suppose the ego will always be involved on some level, haha. The thing is, once I think I have it all figured out, a new situation arises that forces me to look at something about myself that I did not notice before. For example, for most of my life I bottled up my anger. When I got angry with someone I would not say a word and I would keep it all inside. Sometimes the bottle would become uncorked and I would end getting really upset with the person and telling them how I felt, but usually I would just keep it all inside. Then I went through phase where I tried to communicate how I was feeling with that person in a loving and gentle way. This went alright sometimes, but I felt that there was still anger there and I was not permitting myself to be authentic. I don’t think it’s okay to be abusive towards people, but I now feel like it’s okay to let people when you are angry. Even just saying “I’m angry right now,” really makes everything so much better for myself. I am not telling a person that they are making me angry, I am not getting angry at the person, I am just simply owning my anger. I will no longer pretend to be something I am not.This goes with all my wide spectrum of emotions. Interestingly, I find it most challenging and vulnerable to tell someone that I love them or the joy that I feel when I spend time with them. It’s kind of unfortunate that this is the most challenging thing for me to express, but this comes from years of situations that were unhealthy. I am working on it, and I am quite optimistic that I am feeling more comfortable being vulnerable. It’s a bit of a slow process, but I’m okay with that. I think being gentle with myself is the key here. I had this misconception that if I meditated all the time, if I read spiritual books every day, if I prayed all the time, if ate a special diet and if I listened to inspirational teachings on the regular, that I would become this super positive and happy person that would radiate light all the time and make everyone feel special and happy. Well, that really hasn’t been working out for me. That’s maybe just not the person that I am. Self-acceptance is so important to me right now. It’s a big part of being honest with myself. I experience pretty much the whole gambit of emotions on any given day, and that’s just fine by me. No more suppressing these feelings. They have to move and flow. I used to have this idea that a healer or light-worker had to be a certain way. I’m starting to understand that everyone is a healer and a light-worker in their own unique way and that there is no model to follow. Everyone is drawn to who they are meant to be interacting with at any given moment. If you find yourself attracting unhealthy people or situations in your life, it’s important to take responsibility for that and to understand why this is happening. Sometimes the answer is difficult to digest, but it’s certainly worth chewing on. When I don’t like what I am creating in my life, or I don’t like how I am feeling, I do my best to take action right away. A part of this process for me has become allowing myself to express my emotions, hopefully in a healthy manner. This release allows me to move forward and onto a different feeling. When I don’t like a situation I find myself in, I now give myself permission to remove myself from it. Perhaps I helped create it, but that doesn’t mean I have stay in it. Also, it’s been super important for me to learn that I don’t have to stay in relationships and friendships that are unhealthy or abusive. This life is truly amazing, and I can’t wait to look back on this in a year from now and find myself in a totally different place. 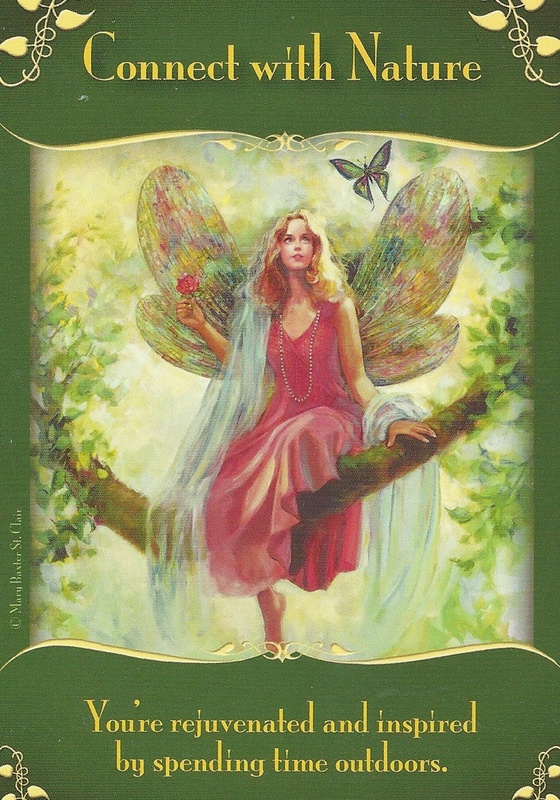 Card: Be Yourself – from the Magical Messages from the Fairies Oracle Cards by Doreen Virtue. 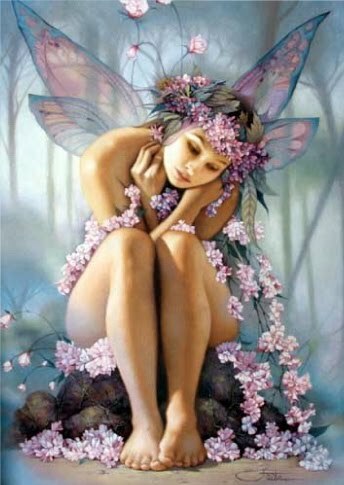 Message from the Faeries: This week we would like to remind you that it is always okay, no matter what, to be yourself. Be yourself at all times. Be true to yourself no matter what. We know that this is often easier said then done. You sometimes want to hide yourself or your true feelings because you are afraid of what others might think of you, or you afraid of the consequences. Here is the thing – not matter what you say or do, at any given moment, is going to result in an action or reaction. There is no possible way of avoiding this. Everything you say or do is going to cause a chain reaction of events to unfold. A simple example would be: You walk into a room, you pick up a tv remote, you turn the tv on, this causes a new source of light and sound to enter into the room, which captures your attention, then the tv show you watch is a sad story and then you cry. Every single thing you do creates a result. Even just breathing results in your very survival. What is it that you are really afraid of? What is stopping you from feeling like you can’t be yourself? Who is stopping you from feeling like you can’t say or do as you feel you should? Without a doubt, we can say that the only person that is really stopping you from being yourself is you. Nobody has the right to stop you from expressing your true thoughts and feelings. Your fear comes from past experiences and the potential from them to reoccur. It’s true that you have no control over how people are going to react to what you say or do. This is our point. It doesn’t matter how people react. This might be really difficult for you to grasp. We understand that you don’t want to hurt anyone or upset somebody’s feelings. Please understand this: if you are being your true, authentic self, you are automatically coming from an honest place. You are coming from the heart, not from a place of fear. It’s true that there still may be an uncomfortable fall-out as a result of you being your authentic self, and speaking your truth. Please know that this is okay. It’s okay to feel uncomfortable. It’s okay if other people are uncomfortable. These are signs. If you are around people who do not like your authentic self, then you are around people who are not in alignment with who you are or who you are becoming. It may be time to surround yourself with new friends or to place yourself in a different environment. It could also mean that there was some healing that needed to be done, and your words or actions have triggered this healing to begin. When people are forced to look at themselves as a result of your words, this can be a bit uncomfortable. This is their issue, not yours, but you may be able to assist them if both parties are willing. It could also mean that the people in your life are just not used to you being yourself and they may need some time to adjust to your changes. Try to be patient and give people the time and space they need to decide if they want to be with you. If they choose not to, then it’s time for both of you to move on. We know it can be challenging or painful to have to let go of people or situations, but when you are true to yourself, you will do whatever it takes to be in a place of love for yourself and others. You can only do this by being yourself. This brings us to the most important part. Being yourself means being honest and loving towards yourself no matter what the cost. This is the greatest act of self-love. You are saying to the Universe that no matter what, you deserve love and respect. When you love and respect yourself, when you listen to your heart and allow it to be heard, you are sending out the most important message: I AM. I AM ME. I AM LOVE. This allows all of your prayers, intentions and words to carry across the heavens to be heard. You become in direct alignment with the divine. Your true self, no matter what, is your divine self. So tell us, who else would you want to be? Erin does personal tarot readings. If you would like a reading done by Erin you find her Etsy shop here. You can get $10 off a reading for the month of November. The coupon code is 11FAERIES. 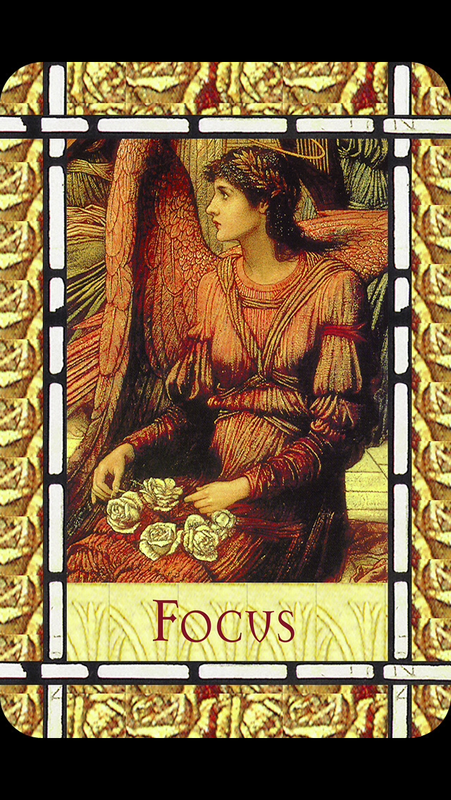 Card: Focus – from the Healing with the Angels Oracle Cards by Doreen Virtue. 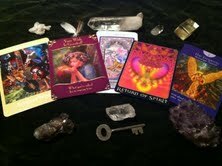 Message from The Faeries: This week we have a very simple request for you: Stay focused. Keep your thoughts and prayers focused on all the things you are trying to create for yourself right now. Be very mindful. Be careful to not let your negative thoughts get carried away this week. Keep your thoughts positive. Please be very diligent about this. Whenever a negative thought comes up, don’t hold on to it, just let it go. Give your negative thoughts away to us, and we will take care of disposing of them for you. After a negative thought has passed, replace it with a prayer and positive thoughts. Keep doing this all week.You are so close to bringing in some amazing things this week, and the only thing that will hold you back is yourself. This is why it is so important that you be mindful and focused on your goals this week. The other thing that we would highly recommend is that you be mindful and careful of who you share your dreams and goals with. Do not let one single person interfere with your dreams coming true. If you happen to mention one of your goals to someone and they say something negative about your goals, ask us to cancel their thoughts and words and to keep them away from your dreams. Do not hold on to other people’s words and actions. Mind yourself and your own thoughts. If you can avoid sharing your goals and aspirations this week, this would be best. These are your dreams, and no one else’s. Every day, spend at least 15 minutes putting some physical action into making your dreams come true. This includes writing about your dreams and aspirations, going out and buying materials for a project, or sitting down and making an object that represents your goal. Whether it’s writing in your journal, doing a ceremony or making a dream board, you should spend time each day this week working towards your goals. Prayers and thoughts go a very long way, and can make your dreams come true, but bringing it into the physical realm will make it happen even faster. DO NOT GIVE UP ON YOURSELF. NOT EVER! 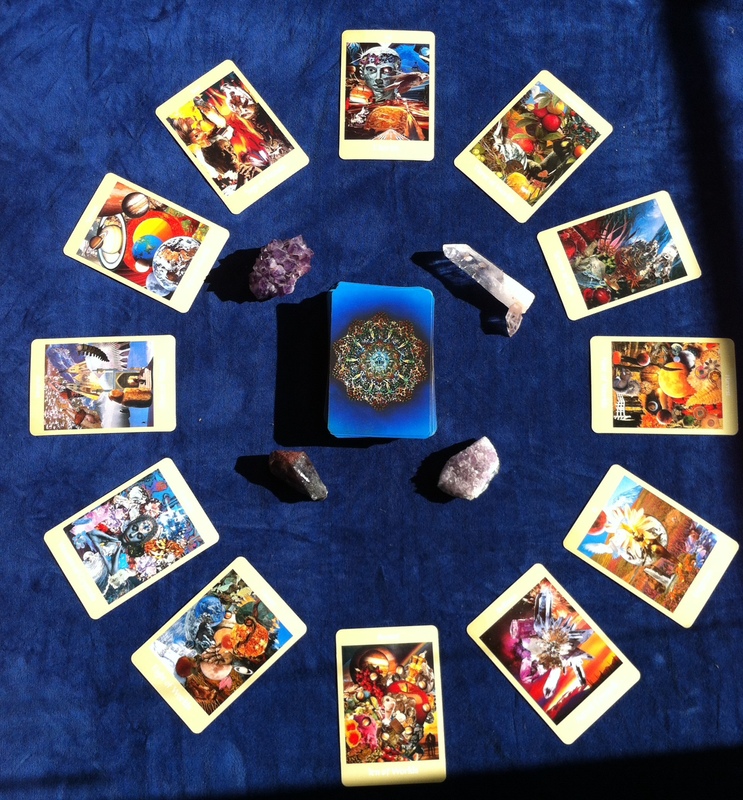 You can get a 30 minutes Skype Tarot Reading from Erin for just $10 this month. Check out her November special. Card: Connect with Nature – from the Magical Messages from the Fairies Oracle Cards by Doreen Virtue. Message from The Faeries: This is a time, seasonally, of great transformation. Depending on where you live, you could be moving from summer to fall, or from winter to spring. Either way, these are both times where everything outside in the “natural world” is moving from one state into another. We have said this before, and not now it is time to remind you again, that when these seasonal changes happen, there is a very special quality to the air that happens. It’s really quite magical, and there are so many health benefits to atmosphere when the plants move into a state of dormancy or rebirth. We are certain that most of you can physical sense this in the atmosphere. It’s as though the air changes it’s smell. It’s as though your senses are heightened at this time, and quite honestly they are. You become more aware or alert. With your senses in full effect, it’s really the best time to be out walking around in nature. It’s the best time of year to be outside, taking in all the beauty, smells, sights, sounds and textures. Just being outside and breathing the air, as opposed to staying inside all the time – which a lot of you have been doing if you have been coming out of the winter – it’s really important to be outside and taking in this very invigorating air. It’s not a coincidence that the Spring and the Fall are traditionally times where people meet and couple with each other. It most certainly something in the air that brings people together. So for those of you who have been single and are wanting to meet their partner – this really is magical time to be outside and to meet other people. Even if you are in a relationship and are just wanting to meet some new people and make new friends – this really is the best time to be out there and meeting people. There really is something magic in the air. We think that being outside in the woods or by the ocean really is best at this time of year, but if you can’t make it to these places, we suggest a walk in the park or just walking through the more quite neighbourhoods of your area. This gives you an opportunity to really take in what’s going on around you – with the plants, trees and animals. Being connected to Nature has so many health benefits on so many levels that volumes could be written about it. So please, go outside! Enjoy the fresh air! Feel the magic! Card: Sarasvati – The Arts – from the Goddess Guidance Oracle Cards by Doreen Virtue. Message from the Faeries: We wanted Erin to pick a card from this deck today, because we wanted to remind you that you are all creators. You are all gods and goddesses. Sometimes you forget this about yourselves, and we felt that you needed a little reminder. 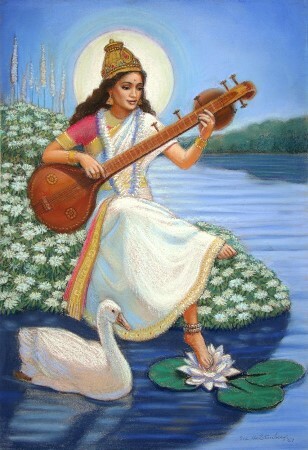 We hope that you can look at this beautiful painting of Sarasvati and that you can somehow identify with it. This goddess, sitting with her foot on a lotus, is no different that you. You have just as much ability to create as she does. Some of you have felt some intense energies going on for the past week or so. Not all of you have been affected by all the planetary and lunar events that have been happening though. Regardless, it’s always a good idea to disconnect from the outer things that are happening around you and to tune into your inner, creative selves. This is your true magic – your ability to create – and each and every single one of you has this gift. We know that we keep telling you to create something and we keep encouraging you to make something. We keep telling you over and over again because it is so incredibly important! The more you encourage and foster your creative aspects, the more you will come to recognize yourselves as creative beings, and our hopes is that you will eventually see yourselves for the creators that you truly are. Our wish, for all of you, is for you to become the gods and goddesses that you all are so that you will feel more empowered and more inspired to create this world into the beautiful and magical place that has always meant to be. So please, spend a little bit of time each day making something. Watch your inner world become more and more beautiful and enriched, and then you will begin to realize that world that exists outside of you is just as full of beauty and magic. 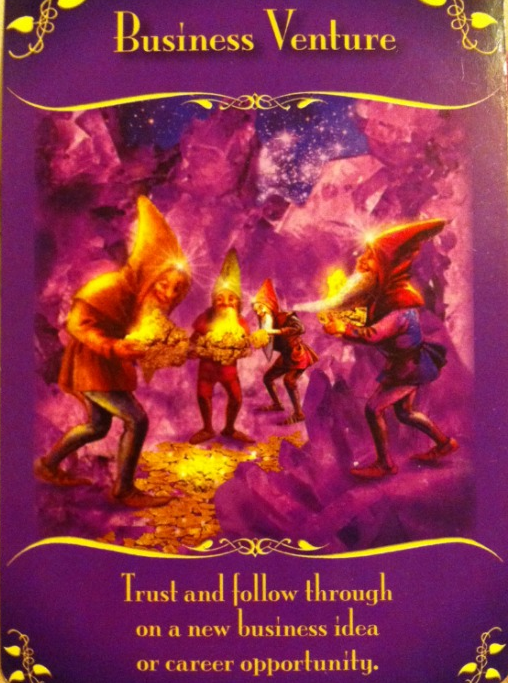 Card: Business Venture – from the Magical Messages from the Fairies Oracle Cards by Doreen Virtue. Message from The Faeries: This week will come to light some new ideas for a business, a project or creative artistic endeavors. We strongly encourage each and every one of you to open your hearts and your minds this week, and to have them joined together so that they can work together to bring into fruition some idea that you’ve had hiding in the back of your brain for the past while. If you allow the Universe to conspire with you, you will find that you will meet new people that would be interested in your new business idea, or you might start seeing signs of guidance that will help you bring your big idea into reality. You will find it helpful to set aside 15 minutes a day to meditation to clear your mind and fill your heart with joy, and then sit down and dedicate 30 minutes a day to your new project or business idea. Just sit down and let everything that comes to your mind flow onto paper. After a week of this you will find your ideas grow and transform into something newer or bigger. You can see all of the gnomes in the image of this card are holding piles of gold in their hands, and we all know that they had to work for this gold. 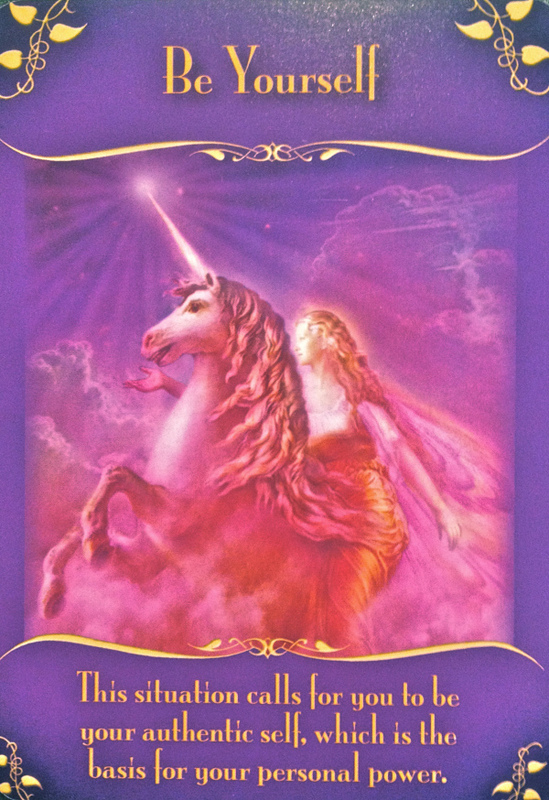 Of course the Universal Love wants to give you everything your hearts desires, and us faeries would absolutely love to assist you in watching your dreams come true, but the trick to having all this happen for you is that you have put work into it as well. You need to put in the time and effort, and most importantly – love and gratitude. It’s not enough to just sit and wish it so. Believe in yourself, believe that the Universe will help you to manifest your dreams and have zero doubts that you can achieve your goals. We know that all of you have some really brilliant ideas. Some of you have a great business plan. Some of you have an amazing book to write. Some of you have a beautiful painting to start. Some of you have a winning idea just waiting to burst outside of you. We know for certain that each and every one of you has something inside of you that is just waiting to come out and be shared with the world. If you were waiting for sign or guidance about whether or not you should follow through with your idea, look no further. The time is now. We look forward to assisting you with your projects and we can’t wait to see all of your new creations! For the whole month of November I am offering Tarot Readings, Angel Card Readings, and Remote Healing work at a special rate. I am offering 30 minute Readings at $20, 60 minute Readings at $40 and 1 Hour Remote Healing work at $40. A reading or a healing session will make an awesome Christmas gift!!! You can look at my Services page here and my Testimonial page here. If you have an questions about my services or the type of work that I do, or you would like to book a session with me, please do not hesitate to contact me at faeriemessenger@gmail.com. I am more than happy to answer any questions or talk about the work I do. I am also very open to doing exchanges and trade for my services.